Out searching for oddities as I sometimes do, I came across an interesting ornamental relative of the common stinging nettle growing in the John W. Nason Garden. 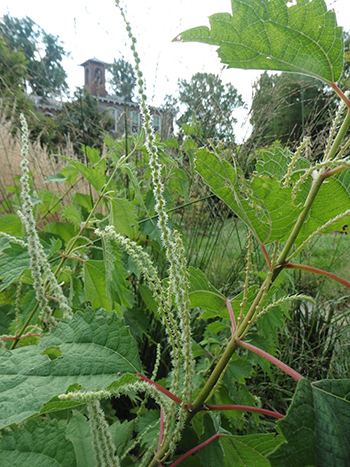 A member of the Urticaceae family, Boehmeria platanifolia (false nettle) bears some morphological similarities to its nettle-kith, with a nearly decussate leaf arrangement and very fine downy, hair-covered leaves and stems (lacking the histamine-injecting, hypodermic-needle-like trichomes). 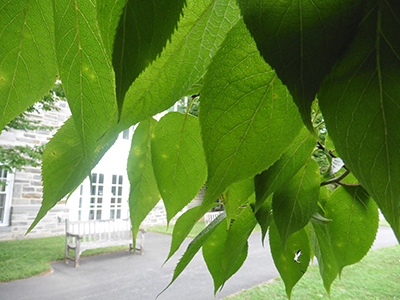 The latin name suggests that it resembles the leaves of the plane tree, Platanus sp., though superficially. It seems much more jagged than any Platanus species I’ve ever seen. The genus is named for 18th century German botanist Georg Rudolf Boehmer. 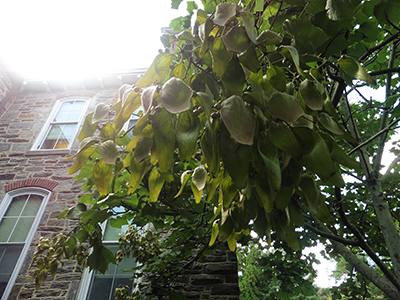 On the south side of the John W. Nason garden, the Firmiana simplex (Chinese parasol tree) is fruiting. It produces chandeliers of green mussel-shell-like bracts that bear small spherical fruits curiously affixed to the margins. It is currently in the mallow family Malvaceae and one can perhaps draw a similarity in the bract-and-sphere fruiting structure of Tilia sp., another mallow family relative. Sources indicate that the genus name honors Austrian Karl Josef von Firmian, governor of the present day Italian province Lombardy, once a part of the Austrian empire. I have walked by this tree many times without a second thought, as it stands inconspicuously on the south side of Trotter Hall north of the Dean Bond Rose Garden. It is, however, a very peculiar and noteworthy plant not only for being the only species in its own family, Eucommiaceae. There are not many plants that require special classification in this way. Fossil records indicate a widespread and diverse number of now-extinct species that were once relatives of this stand-alone extant species (a similar history has been shown for Ginkgo biloba). Eucommia ulmoides, hardy rubber tree, is a Chinese native that is sometimes grown for the latex produced in the bark, twigs, and leaves, which can be dried into a natural rubber. It is a very handsome tree with dark green leaves that bear a resemblance to those of species of Ulmus, inspiring the species name ulmoides.